Over a year ago, my guild mate, Amber, who lives in Australia, sent me two packages of this cookie called "Tim Tam". I'd never heard of it. They are biscuit-like cookies with a flavored layer sandwiched between them and the whole thing dipped in chocolate. It was a lot of fun to have something from the other side of the world. I was in Target a couple weeks ago and had to walk down the cookie aisle to get from point A to point B. I thought I wanted cookies to nosh on but not really, I decided, until I saw this. Wait...what? I've had the regular Tim Tam to the left. The caramel was new to me. I had to try those. Here's a cross section of the cookie. 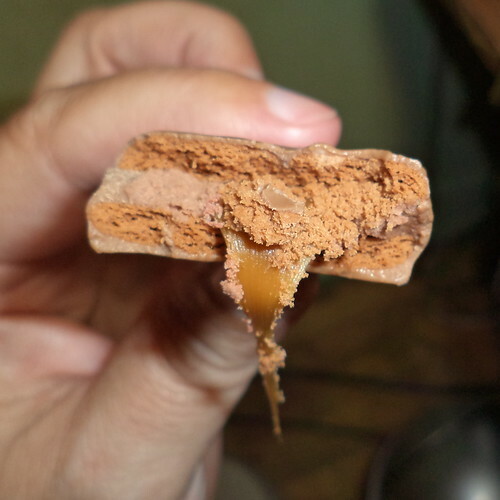 There's the 2 biscuit layers and the cream layer with caramel and the outer chocolate shell. They are good but rather sweet. This is not a tray of cookies you'll sit down and eat all in one sitting. For me, the attraction of these cookies is the connection I have to Amber. If I hadn't known about them, I would have passed them by. They aren't remarkable in their own right; more a novelty in the vast cookie aisle. What they remind me, though, is just how global life is now. 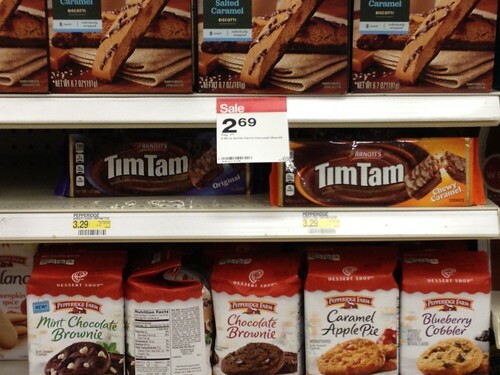 These are an Australian cookie on the shelf of my Wheaton Target. Some executive made the decision to either import them or have a manufacturing plant make them here. I can't see them taking over much more in shelf space, but who knows. Something new and different could garner just enough of a following that we'll see other flavors besides plain chocolate and caramel on the shelves.